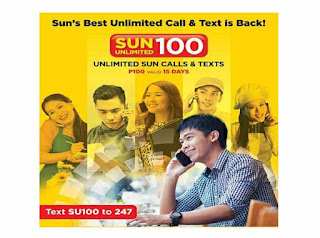 To those who always contact their friends and love ones thru call and text, here’s a new Sun Cellular prepaid promo for 2017 called SU100. You can enjoy unlimited calling and texting from morning until night when you subscribe to this new super unli offer to all their subscribers. For only 100 pesos, you can get the service you wanted for 15 days. It’s now made even more affordable than the previous call and text packages. If you’re a Sun Cellular SIM user, you may try this offer and tell us about your experience using the promo. You only need 100 pesos to register SU100 plus maintaining balance to continue using the service up to 15 days. By simply using the keyword and sending it to Sun Cellular access code, you can quickly enroll to this promo via SMS text. We provided the keyword for your reference in case you’re interested to subscribe. If you prefer postpaid with unli-call and text plan package, try and check out Sun Fixed Load Plan 300. After texting the keyword above, wait for the message notification confirming that the promo is ready to use. That’s it, don’t forget to charge your phone and start using Sun SU 100 unli-call and text promo. I used SU100 for unlicalls to sun but every time i call it is limited for 30 minutes only. and after 30 mins icant call again. may I call smart users also?? ?